Why did I add the green in the middle? Well, one reason is that I've learned it's good to have a place in your quilt for the eyes to stop and focus, something not overwhelming, but a small pop. I may have intended in the beginning to add more greens to the whole piece. Or maybe I had no reason, except that the color was blended in with the blues and I liked it. 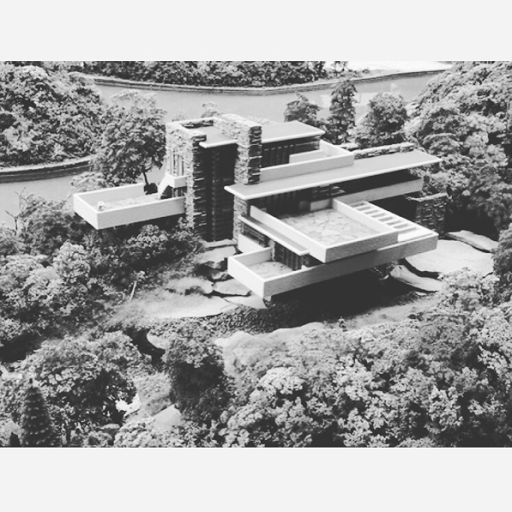 What I noticed about Fallingwater is the sweep of the eye. You look up and center, with the chimneys, then your eyes sweep right, down and left. 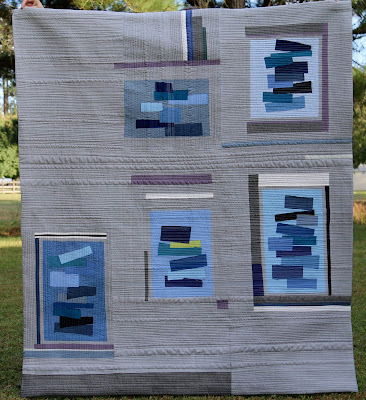 I loved putting together this quilt, I had the idea in mind for many months before I could start, and once I did start not everything went according to my plan. The beauty of inspiration and improv is that you can change your plans along the way and make something even more beautiful than what you originally imagined. 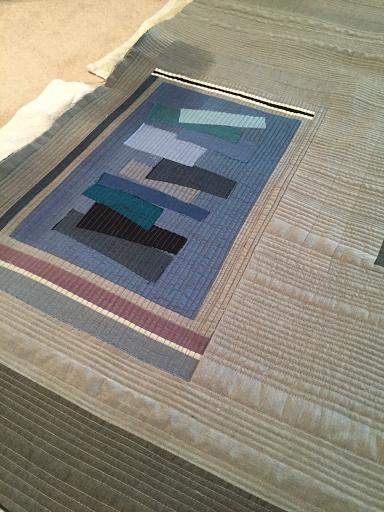 I finished squaring ( you can find tutorials and videos on line on squaring your quilt, try different methods and use what works for you and your quilt). 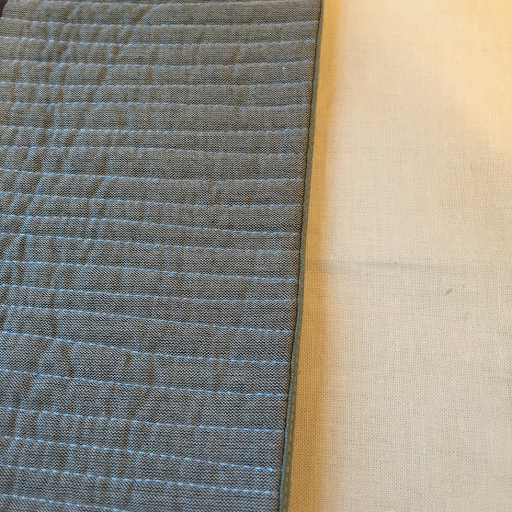 While I was quilting I decided I would like to try faced binding on this quilt. Faced binding folds to the back of the quilt, so you don't see the binding, there won't be a frame on the edges, the quilt will just end. 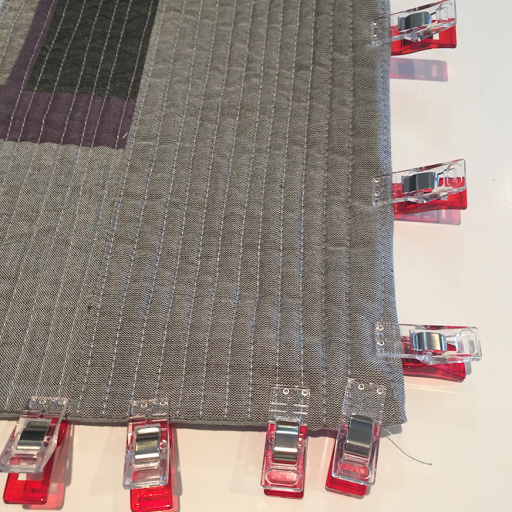 Faced binding is single layer binding, so it more appropriate for a quilt that will hang rather than one that will be used and washed often. I googled, read tutorials, watched you tube videos, I chose elements from a few different tutorials to make my own hybrid process. Press 1/4" fold on the side of the binding that will not be attached to the front of the quilt (this will be your stitch edge for the back of the quilt) Don't worry if it doesn't stay pressed over, the fold was made so you have a good seam line to press again later after the binding is attached. 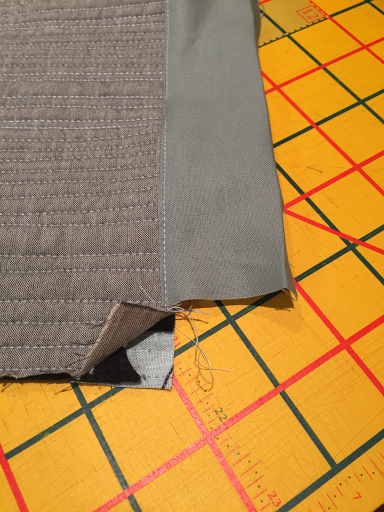 Attach the top and bottom binding pieces in the same manner, pressing toward the outside and adding a top stitch. Next fold over the binding all the way to the back of the quilt and press. 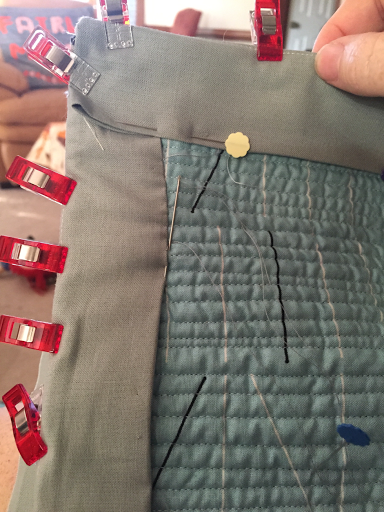 You can re -press your 1/4" seam on the edge of the binding that is not attached to the quilt at this point so you have a crisp line for hand stitching. Pin in place to hand sew down along the back of the quilt. 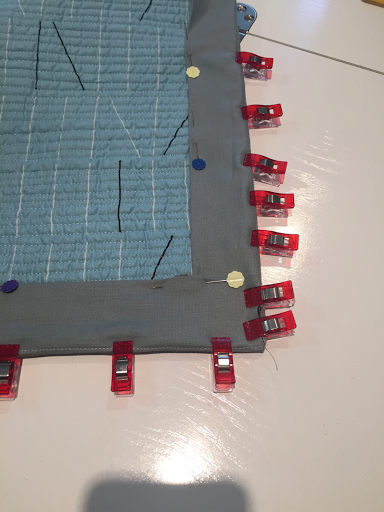 People who know me know I am not a fan of hand sewing (I machine stitch my regular binding on quilts), I have issues with pain in my hands and hand sewing is a contributor. For faced binding there was no way to get around the hand sewing. I took my time and did sections with breaks in between. Finished - no binding showing on the front of the quilt and a crisp edge for hanging. 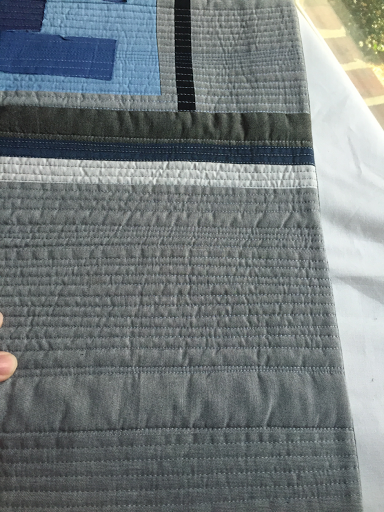 I think this was the perfect finish for this particular quilt. While I was quilting I worked on the name for this quilt. 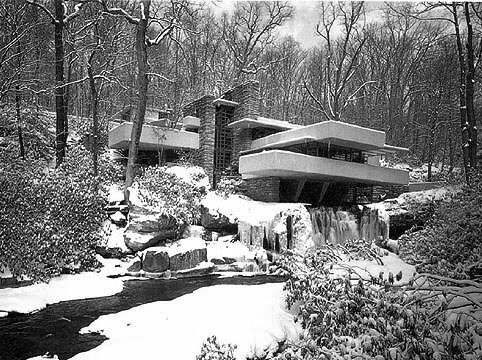 I wanted to incorporate something of Frank Lloyd Wright in the name. 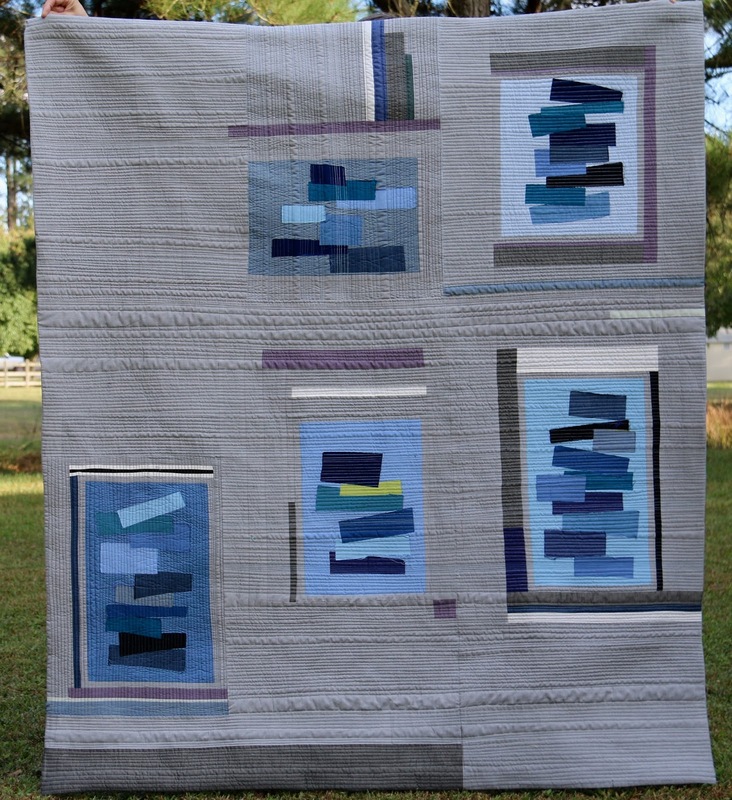 Most of the time the quilt name will come to me while quilting, there is a lot of time to think while you are quilting. 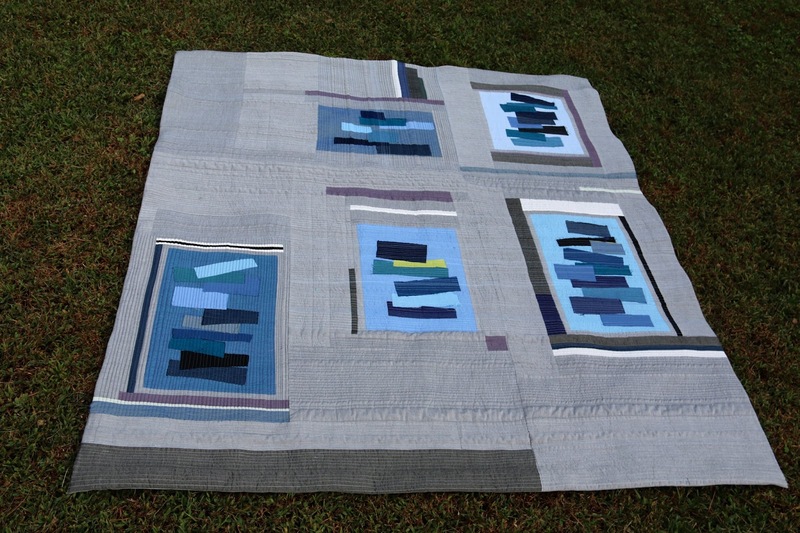 I was not having an easy time with the right name for this quilt - it evolved. Neither was the perfect name and I think I was completely finished and had been calling it Quilt Wright in a couple of posts and emails, because I just couldn't come up with anything else. 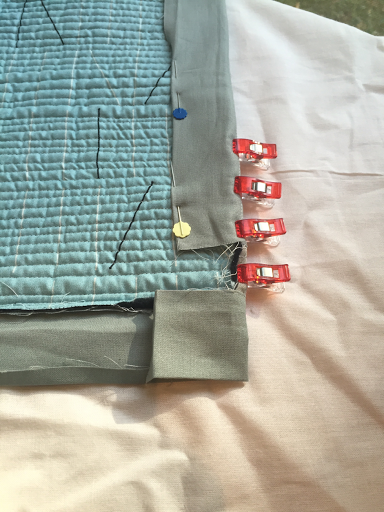 Welcome, I'm writing about quilting, sewing and some other crafting - often just me winging it - my accomplishments and frustrations along the way. I hope you'll come on board and join me on the ride. Welcome - I live and quilt in Virginia Beach. I live here with family, friends, pets (dogs, cat, bunnies). I have an addiction to fabric, looking at it, buying it, hoarding it, and I love cutting it up and putting it together a new way! I like to work with modern fabrics and patterns, but I still fall back on old favorites. I work full time between two businesses, our own construction company, and another; and in between those hours I find time to feed my addiction. Welcome, let's get to know each other.